SEO: Who, What, Why, How, Where, When? “You” know that the business you work for needs customers, clients, or sales to be able to operate. It’s 2016, and hopefully by now you have realized that your website is crucial to ensuring people can find your company, learn about what you do, answer questions they have, buy something from you, or simply get in touch with you. People need to be able to find your website by searching for your company, or important terms related to your company and industry, on search engines like Google, Bing, and Yahoo. So, how do you make sure they find you? That’s where the “what” comes into play. SEO, which stands for search engine optimization, is about making adjustments to what’s on your site, how it’s built, how it functions, and/or how you promote it. These SEO tactics help search engines judge your relevance for searches. Essentially, they help people find you. “Why” should you care about SEO? To put it simply, if no one can find you online, it’s going to be a lot harder to achieve your business objectives. As anyone who has ever searched for something on Google, Bing, etc. knows, in a searcher’s mind, if you aren’t on the first page, you may as well not exist! First, the build of your site is very important. Search engines must be able to “crawl” your site easily. That is, they need to be able to identify who you are, what you do, etc. Here’s how you can ensure this happens: design your site to be mobile-responsive, make sure your title tags and URLs clearly identify what is on each page, and make it is easy for a user to navigate from page to page to find what they are looking for. Second, the creative elements, including content, on your site should reflect your business objectives. The copy you use should reflect why visitors are on your site in the first place. Identify and use relevant industry keywords. Additionally, there are tools to help you pinpoint what terms people searched for to get to your site. The design and layout of your website should also reflect the overall goal of it. If you are selling products online, make buying something a cinch. If you are trying to drive the conversation offline, make the ways to get in touch with you obvious and frequent. Your call-to-action should be near the top of your site and easily identifiable. Pay attention to analytics. What pages are people visiting, and what are they clicking on? How long are they staying on your site? On a specific page? Paying attention to data trends can help identify where you should focus your on-page efforts. Finally, the way you promote your site is important for SEO. Backlinks, or other sites and pages linking to your site, are a way for search engines to determine your authority and relevance to searchers. However, simply placing links all over the web, or even buying links, is a bad way to get backlinks. This is called “black hat SEO.” Search engines frown upon these techniques. Therefore, focus on ways to get quality backlinks by contributing information to other sites or blogs, ensuring any indexes or online databases relevant to your industry include a link to your site in their listings. Finally, be sure to share your content on social media. So, “when” should you do all this? Well, the work of quality SEO isn’t a one-time job. Reviewing how people are getting to your site, where they are looking for information, and what they are doing when there is necessary to climb the SERP (search engine results page) rankings. Again, digging into analytics will help you identify areas that need work and allow you to focus your efforts. 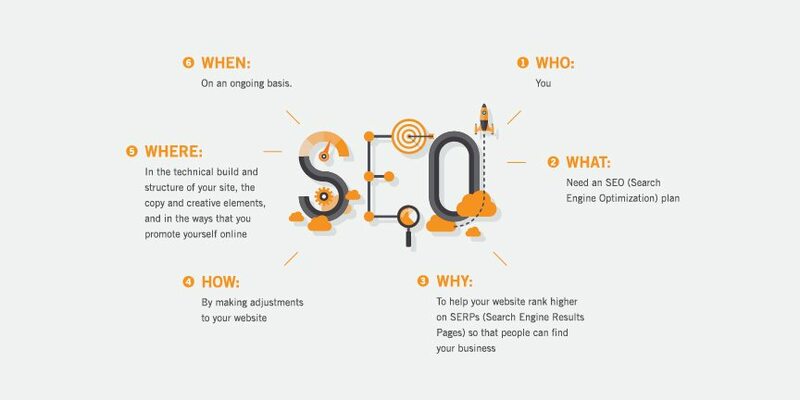 This basic who, what, why, how, where, and when process should give you a good idea of what SEO is and why it is important. For an interesting look at the “science” of SEO, check out the Periodic Table of SEO Success Factors from Search Engine Land.